10 to 15 Series 8 Hole – Center Transition Inside Corner Bracket. The 8 hole – center transition inside corner bracket creates a 90 degree connection between profiles within the same product type (fractional) but of differing series. It has four holes, comprised of two rows and two columns, on each side and it is an external fastening method that requires no machining services. The bracket is flush with the profiles, taking up less space in the overall design. This option can provide infinite positioning along the profile T-slot, allowing for a large degree of adjustability as well as being reconfigurable and reusable. 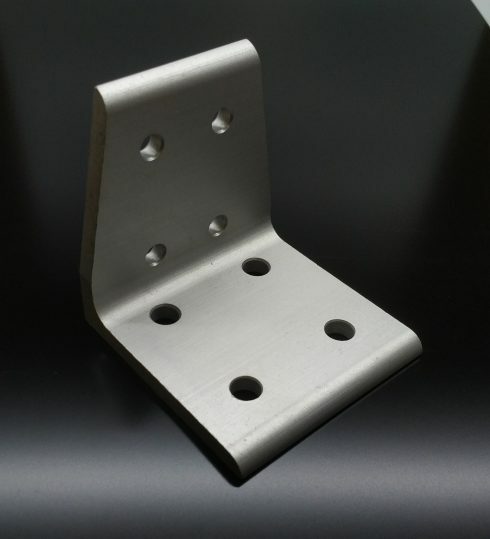 This bracket measures 3″ x 3″ x 2.813″ and 1/4″ thick. The distance between the two larger holes (Ø0.328) is 1.5″, and the distance between the two smaller holes (Ø0.257) is 1.”.